I recommend having a look at the speaker profiles on the Intersections 2011 website. The list is increasing and I’m excited at what a great list of speakers will be at the event in March. 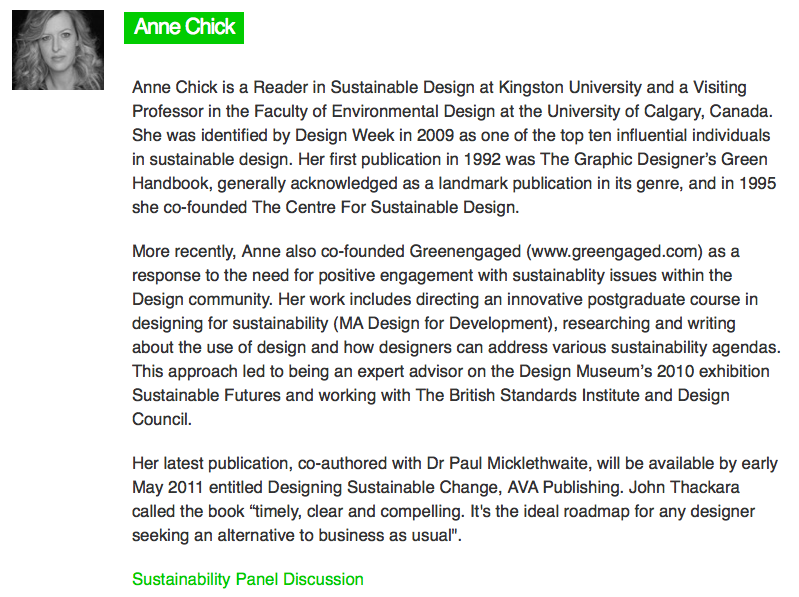 Anne Chick, course leader for the MA degree that I’ve graduated from is going to be part of the sustainability panel session discussing ‘The most beautiful curve is the triple bottom line. Does it make sense to be first to this market?’ I’m interested to hear what they have to say and see how they can make the discussion engaging for their audience. Seeing Anne’s prestigeous write up on the website reminds me how lucky we were to have such an influencial and inspiring tutor running the course! I wonder how many of the speakers will be talking about incorporating service design into their projects/thoughts to help change our lives for the better! ?